One thing I was mulling over that I don’t want to lose was a reaction to an old article I should have read many years ago by Gaspar Feliu i Montfort.1 Now, Professor Feliu has been a great help to me in my research despite never having met me, sending me various useful offprints and expressing interest in my work that reassures me I have something to say even in my field’s homeland. There really should be a decent collection of his papers, and if he wasn’t working on somewhere so fringely or published in the occasional English journal he’d be a medievalist’s household name, because he sees things clearly and explains them likewise. So I guess I count myself as a fan. All the same, only a few 35-year-old papers grow old without any wrinkles at all. In this case my attention was snagged by one thing that I had to stop and think about. Feliu said in that article that there is an obvious distinction in landed property in the Middle Ages, between land that people occupy and work themselves and from which they live, that they pass on as family concerns and so on, and between land that people do not occupy but from whose tenants they merely levy surplus. And so there is, of course, it’s the difference between peasant and aristocrat as Chris Wickham draws it for a start.2 Feliu however notes that land charters don’t distinguish between these two sorts of property, so it’s important to keep in mind what truths about power they may be concealing. This is what snagged me, because it seemed to me firstly that this was an obvious truism, and secondly that it’s one about which I am trained not to worry. Why not? Well, okay, here comes that Hubert Mordek quote again already: “one must always allow for the possibility that the sources are in the right”. Charters were not written to deceive us modern types: if they hadn’t expressed what people wanted expressed, they’d have been varied, in the same way as they are when the property concerned has a winepress that the transactors want explicitly included, or when someone has a islet of property of their own that needs excluding, or even just when the scribe wants more style.5 So we have to consider the possibility that if medieval scribes didn’t draw a difference between the ownership of semi-dependent owner-occupiers and that of large-scale rentiers, that’s because they didn’t conceive of one in the way that we do. To deal with this requires a methodological approach like the one I was attributing to Susan Reynolds in comments on that last-but-one post. If one can’t see two things which seem to be in the same line to your source in the same view, you need to mentally move around until you’re looking at it from where they were mentally standing. This is what we need to do before we can get through the understandable tendency of people to try and judge history by their own standards. So how do we do it here? After some musing I at least came up with an answer that works for me, and predictably has a lot of Matthew’s thinking in it (there were reasons I worked with him, after all). I would say that medieval ownership is not of the actual land, as we might conceive of it, to do with it as you like. Neither however is it separate from the land as Matthew’s view might sometimes seem to imply. I think medieval landed property is the right to take revenue from an identified place. Now this does not preclude in any way that the owner may be doing this by working it him- or herself. In Roman law land that fell out of use for long enough was forfeit; for the medieval usages, this would be highly irregular. If you owned the land you could not necessarily affect whether there was revenue coming off it; but if there was, it was yours to assign and claim. Now if you wanted someone else to work it so that there was revenue coming off it, you would need to leave the situation so that they were somehow able to support themselves, presumably on that revenue or, if they were slaves, some other surplus you controlled. That’s not ownership, though, that’s management. The ownership consists in the primary right to take the revenue, and the variation arises in the ways in which that revenue is ensured. From this angle the charters do not lie to us, and this suggests to me that that’s probably what they actually imply. 1. G. Feliu Montfort, “El condado de Barcelona en los siglos IX y X: organización territorial y económico-social” in Cuadernos de Historia Económica de Cataluña Vol. 7 (Barcelona 1972), pp. 9-31. 2. C. Wickham, Framing the Early Middle Ages: Europe and the Mediterranean 400-800 (Oxford 2005), pp. 386-387. 3. M. Innes, “Practices of Property in the Carolingian Empire” in J. Davies & M. McCormick (edd. ), The Long Morning of Early Medieval Europe: new directions in early medieval studies (Aldershot forthcoming), pp. 000-000. I owe Matthew thanks for letting me see an early version of this paper in draft, and I may have over-simplified the approach of the final version. 4. Elies appears in E. Junyent i Subirà (ed. ), Diplomatari de la Catedral de Vic: segles IX i X, ed. R. Ordeig i Mata (Vic 1980-1996), doc. nos 19 & 33. For discussion see J. Jarrett, “Pathways of Power in late-Carolingian Catalonia” (unpublished Ph.D. thesis, University of London, 2005), pp. 167-172. 5. The last place I heard this point usefully supported was in A. Scott McKinley, “Personal Motivations for Giving Land to the Church in the Eighth Century? The Case of Wissembourg”, paper presented in session “Clods, Altars, Records, and Donors: Reading Narratives and Emotions in Early Medieval Charters“, International Medieval Congress, University of Leeds, 11 July 2006, but it is also touched on in e. g. A. J. Kosto, “Laymen, Clerics and Documentary Practices in the Early Middle Ages: the example of Catalonia” in Speculum Vol. 80 (Cambridge MA 2005), pp. 44-74, and indeed Jarrett, “Pathways of Power”, pp. 66-69. 6. Those interested in this section probably need to, or already have, read S. Reynolds, Fiefs and Vassals: the medieval evidence reinterpreted (Oxford 1994). This term I was expecting to be teaching a scant three lectures, and possibly a few tutorials at King’s College London. This looked like enough, given that in the coming months I shall be moving house, to which city I don’t yet know, and writing or at least rewriting two papers and hopefully doing something serious towards the book, and as you are by now all aware I do have an actual job as well, although here I have recently cut down to four days a week to make more time for research. Anyway, there are also in the article a couple of very useful quotes, and I wanted to put them somewhere and this seemed like the place. One is her own, and the other is a Dominique Barthélemy textbite that I should arguably have seen before. D’ailleurs, toutes les formes de seigneurie ne reposent-elles pas sur une idéologie de la dette? … the possibility of a discontinuous evolution is worth considering. 1. A. Rio, “Freedom and Unfreedom in Early Medieval Francia: the evidence of the legal formulae” in Past and Present no. 193 (Oxford 2006), pp. 7-40. 2. The Keynes article mentioned is S. D. Keynes, “Royal government and the use of the written word in late Anglo-Saxon England” in R. McKitterick (ed. ), The Uses of Literacy in Early Mediaeval Europe (Cambridge 1990), pp. 226-257. The Visigothic Law, should the link in the post not satisfy, is edited as K. Zeumer (ed. ), Leges Visigothorum, Monumenta Germaniae Historica (Leges Nationum Germanicum) I (Hannover 1902, repr. 2005), transl. S. P. Scott as The Visigothic Code (Boston 1922). 4. Ibid., p. 28 n. 70, citing D. Barthélemy, “Qu’est-ce que le servage, en France, au XIe siècle?” in Revue Historique no. 287 (Paris 1992), pp. 233-284 at p. 265. 5. Rio, “Freedom and Unfreedom”, p. 19. An example of the sort of thing I mean, cunningly disguised as a story. At the consecration of the monastery of Sant Benet de Bages in 972, one of the endowment gifts was a piece of land in la Néspola that was given them by a priest whose name was Danlà.1 It was to become theirs when he died, but unfortunately for Sant Benet, Count-Marquis Borrell II, local bigwig and Barcelona main man, repossessed it on we know not what grounds, and passed it on to his main man in la Néspola, the Vicar (a secular office in Catalonia, that basically means you run a castle for the count) and judge Guifré. Mainly Aió held on to the fact that she had a charter, from the late count, the highest power in the land, and that ought to mean something, even though the monastery did too. So in 1000 there was another hearing, at which the judge, a very learned and careful man who went by the name of Ervigi Marc, tried to find a compromise.4 Yes, he admitted, the land was Sant Benet’s, but because it wasn’t Adelaide’s or even her husband’s fault that the land she held had been wrongfully acquired, he said it was unlawful that she and her children should be disinherited without compensation. Unusually for Ervigi Marc, he didn’t cite any law in support of this, which would be because there’s absolutely nothing in the Visigothic Code to defend such a position… but it has equity about it. No-one however was willing to pay the compensation, and so eventually it was agreed that Aió and sons would be allowed to stay on the land, but that firstly they should pay a tascha to Sant Benet annually, that is an eleventh (usually) of all produce, secondly that the revenue from the mill on the estate would be split fifty-fifty between family and monastery, and secondly that at Aió’s or her children’s deaths, whichever should be the later, the lands would revert to the monastery. The point of all this being: the monastery’s endowment act is not seen as finally binding or immutable, despite its heavy divine sanction and multiple signing bishops enjoining excommunication on violators. No-one is thinking of excommunicating Aió. Borrell may have wrongfully appropriated the land, meanwhile, making his grant illegal, but that charter is still valid enough to be recognised; neither legal nor illegal. This is because it is not a document that either has legal force or doesn’t; it is a witness that states that Aió has good reason to hold the land. The second time round, that witness is heard more sympathetically. Lastly: the document that records the outcome of the first suit still survives at Sant Benet—presumably because it gives a better claim than the later one—but even though it was awarded in a court of law after due process an’ ting, it can be put aside and a new verdict pronounced. In other places such a document might have to be destroyed; Sant Benet were presumably cleverer than that. But basically: these charters do not state a legal truth that must be adhered to. They are competing claims in a clamouring court and any of them can be heard or not heard as not just the judge, but those assembled, think fairest and most balanced. Because the aim of the game is not to defend right or wrong to the end, it is to make sure the quarrel stops and that means that you have to ignore the law sometimes because to follow it would be unfair. From this idea of law follows the idea of what the charter’s worth, and that is, as much as it’s made to be by its audience, no matter how solemn it may be and how many curses it threatens. So there you go. 1. Most recently edited in R. Ordeig i Mata (ed. ), Catalunya Carolíngia IV: els comtats d’Osona i Manresa, Institut d’Estudis Catalans: Memòries de la Secció Històrico-Arqueològica LIII (Barcelona 1999), 3 vols, doc. no. 1127. 4. Ibid., no. 1864. On Ervigi Marc and the coterie of judges with whom he worked, see J. A. Bowman, Shifting Landmarks: Property, Proof, and Dispute in Catalonia around the Year 1000, Conjunctions of Religion and Power in the Medieval Past (Ithaca 2004), pp. 81-99. There has for a while now been going on an argument about exactly how literate some of the big early medieval states’ administrations were. For the Carolingian Empire François-Louis Ganshof started it, but since Rosamond McKitterick started concentrating people on it it has snowballed.1 Meanwhile for Anglo-Saxon England James Campbell long ago argued that the Old English state was a heavy user of written orders, written law and so on and I was just reading the other day Simon Keynes’s 1990 article expanding on and nuancing that take, that Campbell has been enlarging ever since.2 And this is just dipping one’s toes in the debate, naturally. Nothing gets scholars going like talking about the making of their source texts, it’s like television about film-making. A lot of Simon Keynes’s article strikes me as special pleading, by now. I have the greatest respect for Simon, but I think that in 1990 medieval scholars generally were only halfway through a parabola from which we have now landed, and Simon’s article is a specimen of the awkward state the debate on these texts was then in, as it tried to shed anachronism and outdated terms and get closer to the way the people who were the subject of the debate thought about the texts we now have left by them. So Simon was then largely taking part, it seems to me, in a debate about how much Anglo-Saxon government used features of administration that we’d think modern, like written instructions, sealed orders, title deeds and proscriptive lawcodes. The problem he faced then and that we still face now is that a lot of the texts we have of such administrative, ‘official’ documents, are not official issue, but records made by interested parties for their own use. Simon has been arguing for a long time that royal Anglo-Saxon charters were from at least I think the late tenth century issued from a central office following the king, a chancery if you will. But many of the manuscripts of such documents, and even more so from earlier, come from the pens of scribes at the beneficiary institutions. The same is true of the lawcodes, I gather; and it’s certainly also true of Carolingian capitularies, which mainly survive to us as amateur compilations even though there is ample evidence, which Ganshof was first to exploit, that texts or at least reports of their contents were sent widely through the Empire. In 1990 Simon was arguing somewhat awkwardly that it was clear despite the preservation that the government was still using lots of documents, and that this made it literate while still making heavy use of oral procedures too. So actually a document was used like a voice. It gave, and preserved, a testimony that was as good as the person that made it—though the making of it may also have involved oaths before God and on altar and so on and thus have various kinds of supporting sanctions, we are not here dealing with a culture that couldn’t envisage that such things might be made up, that the king’s or pope’s seal might even be on a document that he hadn’t issued… In fact we have various papal letters ordering that previous letters sent under the papal seal should be ignored because they were fakes, so really, this shouldn’t be news.8 A document could be false; the witness could be lying. The only difference with the document is that it lasts longer than the witness, and is, if you have an organised archive, much easier to produce. But even though the writers ramp up the Biblical allusion by calling their charters scripturae, it’s still just another witness, and witnesses who can persuade a court better may trump it. It’s just that in seventy years the document will still be telling anyone who wants to find out what it contains, whereas the better witnesses will all be dead. Whatever is transacted by men of this world, to endure for ever, ought to be fortified securely with rabnks of letters, because the frail memory of men in dying forgets what the writing of letters preserves and retains. And this is usually seen as proof that the Church preferred to record its title to lands in writing, but actually I think it’s just about what I’m saying: the parchment lives longer than the trusted local notable, and the Church can afford to wait. So I flatter myself that, although Simon believed then and still I think does that Anglo-Saxon government was much more record- and document-based than I think it necessarily need have been, by starting that article with that quote he was trying to express this idea that nearly two decades of clarification and debugging have made it possible for someone like me to put forth in a simple sentence. These documents are the permanisation of a voice that claims authority. But they’re only more than that if the hearers and readers accept it. Or so I reckon. 1. F.-L. Ganshof, “The use of the written word in Charlemagne’s administration” in idem, The Carolingians and the Frankish Monarchy (London 1971), pp. 125-142; R. McKitterick, The Carolingians and the Written Word (Cambridge 1989); and the subsequent enlargement of the ideas through e. g. eadem (ed. ), The Uses of Literacy in Early Mediaeval Europe (Cambridge 1990) or K. Heidecker (ed. ), Charters and the Use of the Written Word in Medieval Society, Utrecht Studies in Medieval Literacy 5 (Turnhout 2000). 2. J. Campbell, “Observations on English Government from the Tenth to the Twelfth Century” in Transactions of the Royal Historical Society 5th Series Vol. 25 (London 1975), pp. 39-54, repr. in idem, Essays in Anglo-Saxon History, pp. 155-170; S. D. Keynes, “Royal government and the written word in late Anglo-Saxon England” in McKitterick, Uses of Literacy, pp. 226-257; J. Campbell, “The Late Anglo-Saxon State: a maximum view” in Proceedings of the British Academy Vol. 87 (London 1994), pp. 40-65 and now The Anglo-Saxon State (London 2000). 3. For example see the studies in W. Davies & P. Fouracre (edd. ), The Settlement of Disputes in Early Medieval Europe (Cambridge 1986). 4. Easiest access to this material is probably through R. Collins, “‘Sicut lex Gothorum continet’: law and charters in ninth- and tenth-century León and Catalonia” in English Historical Review Vol. 100 (London 1985), pp. 489-512; repr. in idem, Law, Culture and Regionalism in Early Medieval Spain, Variorum Collected Studies (Aldershot 1994), V, but see now J. Bowman, Shifting Landmarks: Property, Proof, and Dispute in Catalonia around the Year 1000, Conjunctions of Religion and Power in the Medieval Past (Ithaca 2004). A case in which the judges ruled a document forged is to be found in C. Devic & J. Vaissete, Histoire Générale de Languedoc avec les Notes et les Pièces Justificatives. Édition accompagnée de dissertations et actes nouvelles, contenant le receuil des inscriptions de la province antiques et du moyen âge, des planches, des cartes géographiques et des vues des monuments, aug. E. Mabille, E. Barry, E. Roschach & A. Molinier, ed. M. E. Dulaurier, Vol. V (Toulouse 1875; Osnabrück 1973), Preuves et documents: chartes no. 158, which says that the charter in question “had neither been confirmed either with signatures or subscriptions nor legally drawn up, but clearly drawn up with adulterine signatures and subscriptions” (my translation). 5. Referring to P. Wormald, “The uses of literacy in Anglo-Saxon England and its neighbours” in Transactions of the Royal Historical Society 5th series Vol. 27 (London 1977), pp. 95-114. 6. Since developed in Patrick Wormald, The Making of English Law: King Alfred to the twelfth century (Oxford 2006). I miss Patrick Wormald. 7. Thinking of P. Wormald, “Lex Scripta and Verbum Regis: legislation and Germanic kingship, from Euric to Cnut” in P. H. Sawyer & I. N. Wood (edd. ), Early Medieval Kingship (Leeds 1977), pp. 105-138. 8. E. Pitz, “Erschleichung und Anfechtung von Herrscher- und Papsturkunden vom 4. bis 10. Jahrhundert” in Fälschungen im Mittelalter. Internationaler Kongreß der Monumenta Germaniae Historica, München, 16.-19. September 1986, Teil III: diplomatische Fälschungen (I), Monumenta Germaniae Historica (Schriften) XXXIII.3 (Hannover 1988), pp. 69-113 at p. 106, n. 135. Likewise this error holds ignorant and rustic men, that they think that January 1st is the beginning of the year. This is altogether most false. For, as Sacred Scripture says, the beginning of the year was established on 25th March at the time of the Equinox. For thus is it written: ‘and God divided the light from the darkness’. For all right division has equality, as on 25th March the day has the same length of hours as the night. And therefore it is false that the beginning of the year is on 1st January. Question: where can you find King Æthelred the Unready alongside his rival Cnut, and Edward the Confessor, Henry I, Henry III and indeed Henry IV and not least Gloriana herself, Queen Lizzy the One all looking on, or at least sideways? Answer: under my scanner of a workday afternoon. 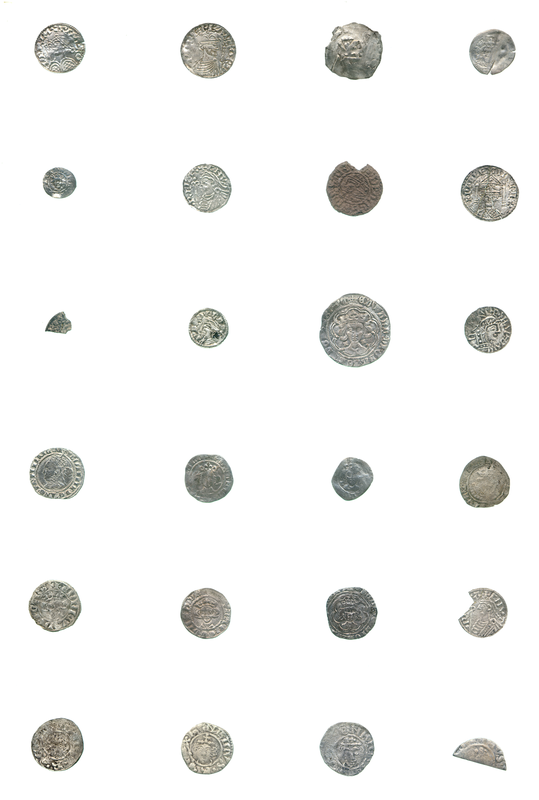 These are coins that we’re scanning for Martin Biddle for the long-awaited book on the decades of Winchester excavations he’s carried out; the ones on this scan belong to the Winchester Museum and will be accessible for scholars there fairly shortly after I’ve finished with them. It’s not what I ultimately want to do, but there’s a lot to be said for this job.